As the climate warms and the ice melts, the Arctic could become the next great theater of global cooperation—or a battlefield. One hundred and sixty-eight years ago this past July, two British warships—HMS Erebus and HMS Terror—sailed north into Baffin Bay, bound on a mission to navigate the fabled Northwest Passage between the Atlantic and the Pacific oceans. It would be the last that the nineteenth-century world would see of Sir John Franklin and his 128 crew members. But the Arctic that swallowed the 1845 Franklin expedition is disappearing, its vast ice sheets thinning, its frozen straits thawing. And once again, ships are headed north, not on voyages of discovery—the northern passages across Canada and Russia are well known today—but to stake a claim in the globe’s last great race for resources and trade routes. There is a great deal at stake. The US Geological Survey estimates that the Arctic holds 13 percent of the world’s oil reserves and 30 percent of its natural gas. There are also significant coal and iron ore deposits. As the ice retreats, new fishing zones are opening up, and—most importantly—so are shipping routes that trim thousands of miles off voyages, saving enormous amounts of time and money. Expanding trade will stimulate shipbuilding, the opening of new ports and economic growth, especially in East Asia. Traffic in the Northern Sea Route across Russia—formerly known as the Northeast Passage—is still modest but on the uptick. The easiest of the northern routes to traverse, the passage has seen an increase in shipping, from four vessels in 2010 to seventy-one in 2013. And for the first time in history, a liquid natural gas tanker—the Ob River—made the trip in 2012. On a run from Hammerfest, Norway to Tobata, Japan, the ship took only nine days to traverse the passage, cutting almost half the distance off the normal route through the Suez Canal. Which is not to say that the Northern Sea Route is a stroll in the garden. The Arctic may be retreating, but it is still a dangerous and stormy place, not far removed from the conditions that killed Franklin and his men. A lack of detailed maps is an ongoing problem, and most ships require the help of expensive icebreakers. But for the first time, specially reinforced tankers are making the run on their own. Tensions in the region arise from two sources: squabbles among the border states (Norway, Russia, Canada, the United States, Denmark, Finland, Iceland and Sweden) over who owns what, and efforts by non-polar countries (China, India, the European Union and Japan) that want access. The conflicts range from serious to somewhat silly. In the latter category was the 2007 planting of a small Russian flag on the seabed beneath the North Pole by private explorer Artur Chilingarov, a stunt that even the Moscow government dismissed as theatrics. 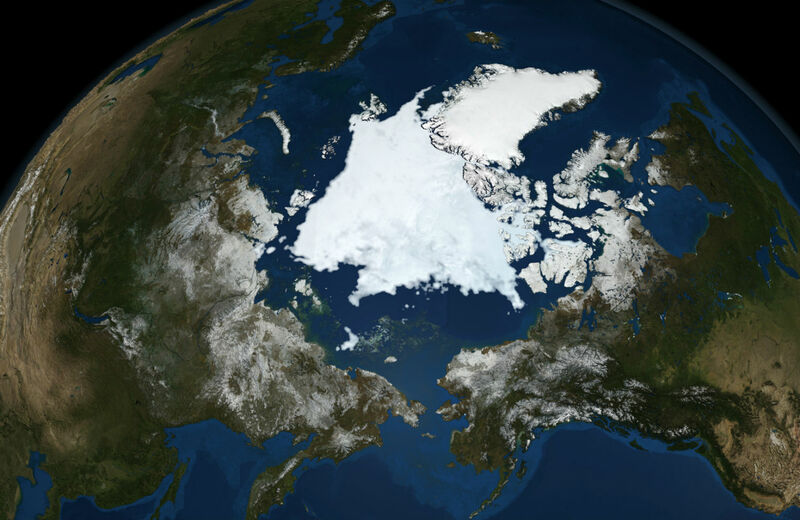 But the Russians do lay claim to a vast section of the North Pole based on their interpretation of the 1982 Convention on the Law of the Sea, which allows a country to claim ownership if an area is part of its continental shelf. Moscow argues that the huge Lomonosov Ridge, which divides the Arctic Ocean into two basins and runs under the Pole, originates in Russia. Canada and Denmark also claim the ridge as well. Canada organized an expedition this past summer to find out what really happened to Franklin and his two ships. The search was a success—one of the ships was found in Victoria Straits—but the goal was political, not archaeological: Ottawa is using the find to lay claim to the Northwest Passage. Copenhagen and Ottawa are meanwhile at loggerheads over Hans Island, located between Ellesmere Island and Danish-controlled Greenland. The occupation of the tiny rock by the Canadian military has generated a “Free Hans Island” campaign in Denmark. The US government has been trying to stake out terrain as well, though it’s constrained by the fact that Washington has not signed the Law of the Seas Convention. The United States has locked horns with Canada over the Beaufort Sea, and the Pentagon released its first “Arctic Strategy” study last year. The United States maintains 27,000 military personnel in the region, not including regular patrols by nuclear submarines. The Russians and Canadians have ramped up their military presence in the region as well, and Norway has carried out yearly military exercises—“Arctic Cold Response”—involving up to 16,000 troops, many of them NATO units. But you don’t have to be next to the ice to want to be a player. China may be a thousand miles from the nearest ice floe, but as the second-largest economy in the world, it has no intention of being left out in the cold. This past summer the Chinese icebreaker Snow Dragon made the Northern Sea Route run, and Beijing has elbowed its way into being a permanent observer on the Arctic Council. Formed in 1996, the council consists of the border states plus the indigenous people who populate the vast frozen area. Japan and South Korea are also observers. Tensions are currently high in East and South Asia because of issues deliberately left unresolved by the 1952 Treaty of San Francisco that ended World War II. As Canadian researcher Kimie Hara recently discovered, the United States designed the treaty to have a certain amount of “manageable instability” built into it by leaving certain territorial issues unresolved. The tensions that those issues generate make it easier for the United States to maintain a robust military presence in the region. Thus, China and Japan are involved in a dangerous dispute over some uninhabited islands in the East China Sea—called the Diaoyus by China and the Senkakus by Japan—because the 1952 treaty did not designate which country had sovereignty. If it comes to a military confrontation, the United States is bound by treaty to support Japan. Similar tensions exist between South Korea and Japan over the Dokdo/Takeshima islands, between Japan and Russia over the Northern Territories/Southern Kurile islands, and between China, Vietnam and Taiwan over the Spratly and Paracel islands. Brunei and Malaysia also have claims that overlap with China’s. Any ships traversing the East and South China seas on the way north will find themselves in the middle of several nasty territorial disputes. In theory, the economic potential of the Arctic routes should pressure the various parties to reach an amicable resolution of their differences, but things are complicated these days. Russia has indicated it would like to resolve the Northern Territories/Kuriles issue, and initial talks appeared to be making progress. But then in July, Tokyo joined Western sanctions against Russia over its annexation of Crimea, and negotiations have gone into the freezer. The Arctic may be cold, but the politics surrounding it are pretty hot. At the same time, the international tools to resolve such disputes currently exist. The first step is a commitment to put international law—such as the Law of the Seas Convention—over national interests. The Chinese have a good case for sovereignty over the Senkaku/Diaoyus, and Japan has solid grounds for reclaiming most of the Southern Kuriles. Korea would likely prevail in the Dokdo/Takeshima dispute, and China would have to back off some of its extravagant claims in the South China Sea. For all the potential for conflict, there is a solid basis for cooperation in the Arctic. Russia and Norway have divided up the Barents Sea, and Russia, Norway, the United States and the United Kingdom are cooperating on nuclear waste problems in the Kola Peninsula and Arkhangelsk. There are common environmental issues. The Arctic is a delicate place, easy to damage, slow to heal.